The lymphatic system plays a vital role as one of the organ systems of the body. This system functions with the digestive system to absorb dietary lipids , which enter lymphatic vessels rather than blood vessels for transport. It also acts with the cardiovascular system to control the body's fluid balance. This is accomplished by a series of interconnected thin-walled lymphatic vessels that permeate the body's tissues that collect substances lost through the walls of capillaries. These lymphatic vessels drain into lymphatic trunks and then into veins. If lymphatic drainage is temporarily or permanently blocked, the buildup of interstitial fluid creates a condition called lymphedema. In tropical areas of the world, a mosquito-borne roundworm can infect lymph nodes, blocking lymphatic drainage and thereby creating a condition called elephantiasis. The lymphatic system also plays a vital role in immunity by providing a defensive network against pathogens . Multiple lymphatic organs, all with specialized functions, work together for this purpose. Lymph flowing along the lymphatic vessels passes periodically through lymph nodes, primarily in the neck, armpit, and groin regions. The nodes contain lymphocytes and macrophages that mount an immune response to any pathogen borne within this fluid. 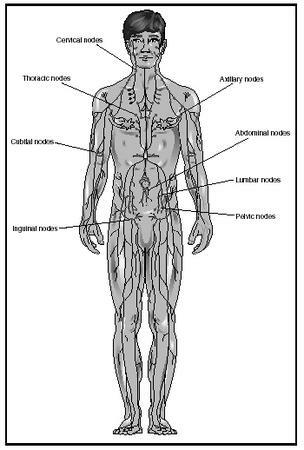 Lymphatic vessels also lead to lymph nodes near internal organs such as the heart, lungs, and alimentary canal (gut). A lymphangiograph of a man, showing cervical, thoracic, cubital, inguinal, axillary, abdominal, lumbar, and pelvic nodes of the lymphatic system. Lining the alimentary canal are collections of mucosa-associated lymphatic tissues (MALT) that form lymphatic nodules. Clusters of lymphatic nodules are also deep to the lining of the alimentary canal. These include Peyer patches of the ileum (lower small intestine) and appendix that guard the entry of pathogens into the internal environment. When the appendix becomes inflamed, appendicitis results. Other lymphatic organs—the tonsils, thymus, and spleen—also play a critical role in immunity. The tonsils include the pharyngeal tonsil located in the rear of the nasopharynx, the palatine tonsils to the side of the tongue, and the lingual tonsils at the base of the tongue. Together, the tonsils form patches of lymphatic tissue that encircle the back of the oral and nasal cavities as a defense mechanism to detect pathogens before they enter the alimentary canal. If the tonsils become infected, a tonsillectomy may be necessary. The thymus is found deep to the sternum (breastbone) and superficial to the pericardial sac surrounding the heart. The thymus contains lymphocytes that differentiate into T cells . These cells are vital to the proper function of the immune system. Finally, the spleen is located in the left upper quadrant of the abdomen. It has several functions. Its red pulp stores erythrocytes (red blood cells) for use in cases of sudden blood loss, whereas the white pulp contains macrophages and other leukocytes (white blood cells) that break down old erythrocytes as they squeeze through splenic sinuses. Additionally, these leukocytes can mount an immune response and fight infections that enter this organ. As the spleen contains many vessels, it bleeds easily when ruptured. In such cases, removal of the spleen (splenectomy) may be required to prevent fatal hemorrhage. Moore, Keith L., and Arthur F. Dalley. Clinically Oriented Anatomy, 4th ed. Baltimore, MD: Lippincott Williams and Wilkins, 1999. Saladin, Kenneth S. Anatomy and Physiology: The Unity of Form and Function. Dubuque, IA: McGraw-Hill, 2001. This is a great site i found everything i needed for my science project, just wanted to say thanks.